As a part of today's book blast, I have a special treat for you guys. The hilarious Daniel Cohen was kind enough to do an interview for us bibliophiles to promote his new novel, Masters of the Veil. I have to tell you, this is probably one of the funniest interviews that I've ever done. There was a lot of laughter involved on my end. I think you guys are going to enjoy his answers as much as I did. You can also enter to win a $100 gift code from Amazon if you are up to battling the intimidating Rafflecopter beasty at the end of the post. Daniel A. Cohen was just your average business student. Microeconomics, finance, marketing… you name it, he had to do a PowerPoint presentation on it. One dark and stormy night, he was bitten by the radioactive realization that memorizing business jargon could possibly be the most boring activity known to man. 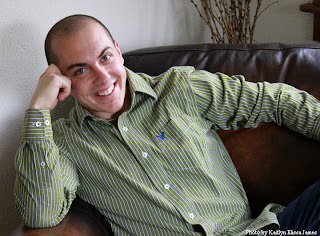 After gaining eagle-eye vision, abs that could grate cheese, and a talent for imagining things (including his cheese-grating abs), he wrote his first novel and began his epic battle against the formidable business jargon. He continues to fight the good fight by playing saxophone and writing YA fantasy, forever hoping his Veil trilogy will help inspire others to join his cause. Daniel, I would like to thank you before we do anything else for agreeing to do this interview - I know you're busy getting ready for BEA. When did you write your first book? My first book, The Ancillary’s Mark was written when I was nineteen years old. Funny enough, I started writing it when I was selling cars at a Nissan dealership. There was a ton of downtime, so when the older guys were staring out of the window or fooling around on the Internet, I tried my hand at something productive. I had no idea it would become a career. Did you offer free copies of your novel to anyone who bought a new car? I actually would have, but by the time it was published I had already moved on to bigger and better things. And by that I mean making minimum wage at Barnes and Noble. But I did get to hand-sell my book there, which was pretty cool. What inspired you to write Masters of the Veil? How long did it take you to write Masters of the Veil? From idea to final draft took about three years. What do you think it is that sets Masters of the Veil apart from other fantasy novels? Most fantasy novels that I’ve read have been centered around an outcast type who finds his/her place in a fantasy world. MOTV tells what happens when the opposite happens. Sam Lock is a high school football star who finds himself in a magical world and struggles there. How much did your being a musician effect the way you told the story? Hey, cool! You know that I’m a musician! It came through big time in Glissandro Thicket (my favorite character after Sam). He’s a mute sorcerer who has found a way to speak through music. I had a lot of fun meeting him, and he taught me some really important things. Google knows everything – and I may be peeking in your windows. But to be serious, did you write any songs based on Glissandro and the book, or did you just play/listen to other music? Uh…. Uh… the batman underoos I wear to bed are a joke. *Nervously tugs collar* Yeah, just a joke. And yes, I am available for Bar-Mitzvahs. Which character did you have the most fun writing? Actually the character I’m having the most fun with doesn’t show up until the sequel, Children of the Veil. I can’t tell you about him without spoiling things, though. Was he based on anyone? He was sort of inspired by Frankenstein’s monster, and Valentine Michael Smith from Stranger in a Strange Land. Now that your book has been published, is there anything that you would have done differently? I would have told younger Dan not to have his hopes set on giving up his day job just yet :) Ah, the naiveté of a young writer. Wait… Do you mean that the author’s life does not consist of sitting on the beach and eating bonbons? What do you do when you are not writing? Well, I quit my job about a week back. I was working 60 hours a week and I didn’t have any time or energy to write or play music, so I’m on the hunt for something less stressful. But I think if this keeps up much longer, purchasing any of my books may be considered a charitable contribution. Do you have a funny story about something that happened while you were writing or researching your novel? You know what’s weird? Reviewers keep saying that MOTV is a very funny book but it wasn’t intended to be so. It was written during the darkest years of my life and I have no idea how it came to be so lighthearted and humorous. I know I sound melodramatic, but I guess that irony in itself is funny? Maybe? I think it was just your awesome leaking. Still, was it hard to write the book during that dark period, or did the writing help you get through it? My editor has a term for it: literary therapy. And it did help. Sometimes it was the only thing that kept me going. Okay, as we wrap things up, I have to ask – can you tell us a little about those cheese-grating abs? Alas, they’re such a burden. I have delis and Italian restaurants from all over the world trying to recruit me, but I just want to stay a normal civilian. How else can I finish the Veil trilogy? "This Book was brilliant, creative, and completely magical. 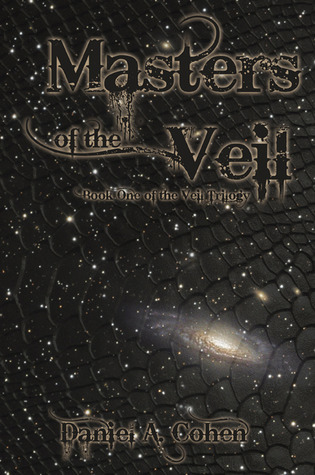 If you want an amazing book to read in 2012, I would suggest you go to the bookstore and pick up a copy of Masters of the Veil." "I loved this book. I could list all the reasons, but there is one piece of praise I think sums up the book best. My son grabbed it as soon as I was finished reading it and hasn't put it down since. Dan Cohen has a winner with this series." Daniel Cohen is offering one lucky person a $100 Amazon.com Gift Card. Open to anyone who can legally enter, receive and use an Amazon.com Gift Code. The winner will be chosen by rafflecopter and announced here as well as emailed and will have 48 hours to respond or a new winner will be chosen. Winning Entry will be verified prior to prize being awarded. You must be 18 or older to enter or have your parent's permission. This giveaway is in no way associated with Facebook, Twitter, Rafflecopter or any other entity unless otherwise specified. The number of eligible entries received determines the odds of winning. VOID WHERE PROHIBITED BY LAW.